TLC is a new comedy series currently showing on BBC2. Georgia Mackenzie plays the smart, cool and professional Staff Nurse Judy against Reese (League of Gentlemen) Shearsmith's confused, disorganised and above all sleep-starved Junior Doctor Flynn. For more information on the programme and cast, click here. 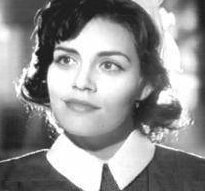 The black and white pics are from a fantasy sequence where the besotted Dr Flynn imagines that he and Nurse Judy are in a 1950s film, the rest show Nurse Judy and her colleagues in normal uniform. 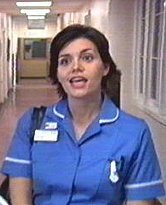 Staff nurse Judy experience a fantasy sequence, 'TLC', UK 2002. 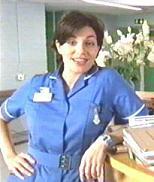 Staff nurse Judy played by Georgia Mackenzie, 'TLC', UK 2002.